A supply chain is a network of numerous autonomous entities (i.e., suppliers, manufacturers, assemblers, distributors, wholesalers and retailers). 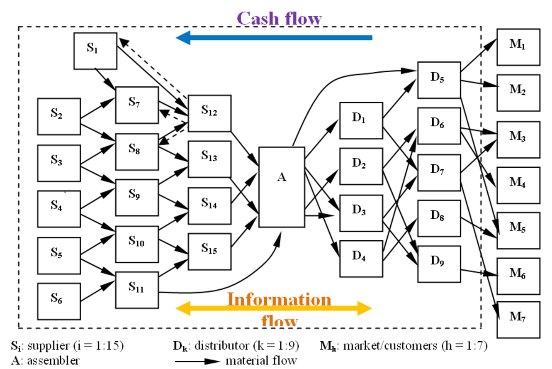 Material, information and cash are three main flows going back and forth along the chain through all entities. Supply Chain Management (SCM) refers to the effort of managing flows, processes, and functions along the entire chain with purpose of maximizing overall profitability by satisfying end customers. Design and simulation of automated transportation system for raw materials and finished products at Stella Polaris. Initial supplier selection and management are also engaged. Warehouse design and Integration at Brødrene Karlsen. Design and simulation of the packaging system of fish related product at Brødrene Karlsen. Effective and efficient management of material, information and capital at intra- and/or inter-company level. Supply chain management can be used at both intra-company level for improving efficiency and productivity, and inter-company level for enhancing coordination between companies. At intra-company level, methods, i.e., automation, warehouse management, simulation and optimization, etc., can be used for improving the internal logistics. At inter-company level, methods, i.e., supplier selection and management, simulation and optimization, etc., can be used for improving the supplier relation management and customer relation management. Design and development of automated manufacturing system. Development of simulation and optimization method for the manufacturing process and the supply chain. Development of methods for supplier selection. Integrating automation and technologies in the manufacturing and logistics for improving efficiency, productivity and working environment (Remove people from harsh working environment). Providing simulation and optimization of the improved process for a better understanding and decision-making. Developing criteria for supplier selection and management.